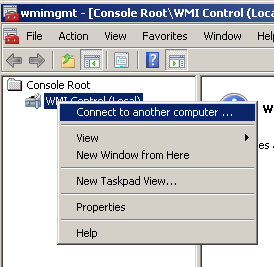 While working with new windows 7 migration project, we had lot of computers with wmi issue but how to identify which has wmi and fix it automatically. There could be various reasons if configmgr client is not reporting to site server but wmi issue one of major problem .if wmi issue occur, nothing can be performed on configmgr client. No policies, no inventory information nothing will be received or sent to MP. It would be difficult to identify machines which as WMI corruption so either you can apply wmi script Via GPO to run every time when computer boots up else go with psexec to run the script remotely or different methods which you would prefer. I come up with simple script that check the functionality of WMI if WMI is working fine, exit the script else repair WMI functionality. if the the above command gives any output,script exit else repair it. 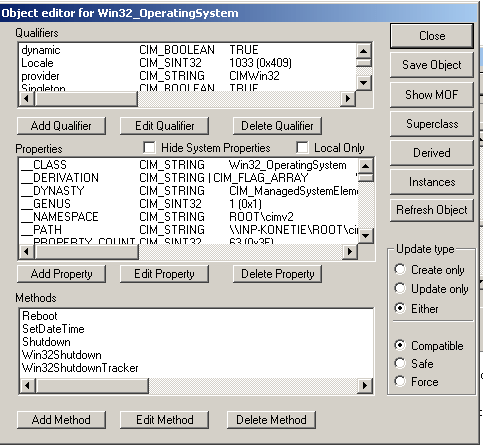 Some theory about WMI and how to check if it is working or not. · Start a process on a remote computer. · Schedule a process to run at specific times on specific days. · Reboot a computer remotely. · Get a list of applications installed on a local or remote computer. · Query the Windows event logs on a local or remote computer. 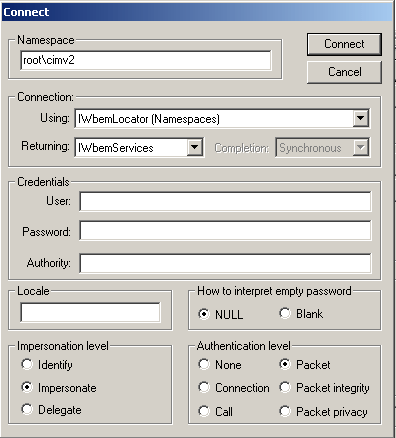 The Default Name space is root\cimV2 .You have many namespaces available in WMI. You can see lot of classes available for cimV2 name space. For more information about available classes in WMI namespace called cimV2 ,please look at here http://msdn.microsoft.com/en-us/library/windows/desktop/aa394084(v=vs.85).aspx with its description and objects within it. Now you can see all the classes available within cimV2 name space. Click on apply to see the results. You can execute any query which has correct syntax to get the correct information. How do you run wbemtest on remote computer? 1. 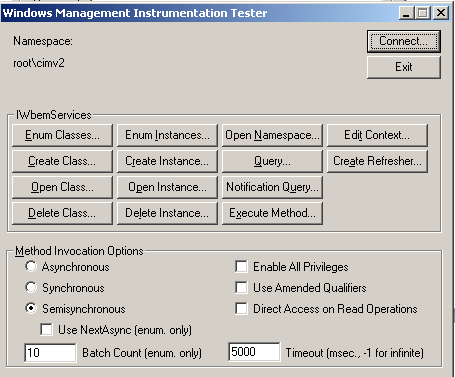 To connect remotely using tools like CIM Studio or Wbemtest, you must specify a namespace in the form "\\<machinename>\root\<namespace>"
For example: \\mymachine\root\cimv2 as shown below and perform the steps whatever you need as did above. 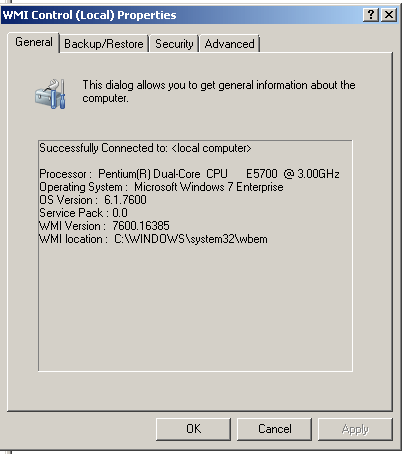 How do you check remotely if WMI is working well or not ? 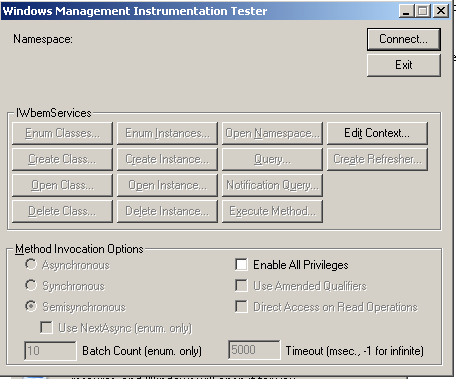 22 Responses to "How to Fix WMI issues automatically"
Thank you very much Eswar for this blog, after implementing this it saved our time. I have 2 query, please help me in that, im receiving following messages. 1. The handle is invalid. I checked manually able to access print and share but not success on some the machines. Access denied refers to permission issue. 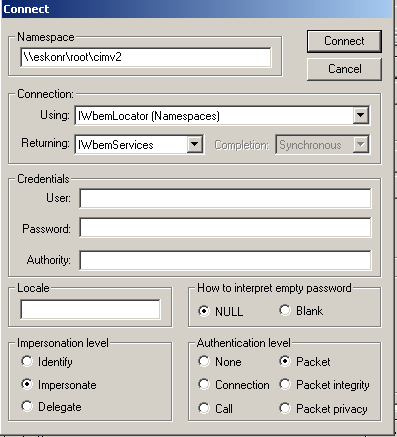 You must run as account that has permissions to connect to wmi. And the handle is invalid ? Thank you very much for the information. Very good article! It helped us solve a big problem. Thanks again! Can this be deployed to client's via application or package?? And if so how?? if you have WMI issues, client will not be able to download policies from SCCM and you cannot deploy anything due to WMI issue. If the client is able to receive the policies etc ,you will have No or less issues on WMI. So what method would you suggest using to repair the WMI remotely?? How to run on it a remote computer? didn't return any results or know if it ran successfully? Wont this only let you know when win32_ComputerSystem in the CIMV2 space is bad. It seems you could have corruption in other name spaces and still get successful results back. Or is this the only namespace that really matters to SCCM and thus why you only test that space. I guess one could put as many tests before the rebuild which test for failure and if at least 1 fails, then rebuild. If WMI is not working,then it would be issue with name space but not the with class like win32_computersystem.I don't see any scenarios like win32_computersystem class working but other classes(like win32_opearatingsystem) has issues while retrieving information. did you see any such scenarios ? 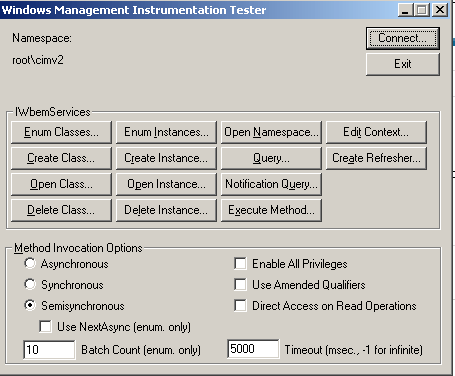 CIMV2 is the namespace used to retrieve the Client info to CM database. Amazing Stuff Eswar..!!!! Your script saved my lots of time and logging case with PSS. I was working on repairing WMI for more 24 hours but it was failing. Your script worked like charm and all my issues got resolved. Once again Thank You so much for making and providing this script. 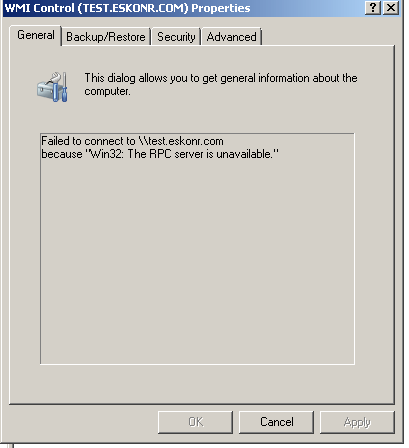 Sending out via PSEXEC isn't working to the systems with problems due to WMI and RPC not functioning properly. yes,if you try to run on local computers,you will get prompt displaying the progress of the script .Over remote computers,i dont see any prompt.,prompt only shows on local machine from where you run but not remote. If you have issues connecting to remote computers,you will have to check if you have access to wmi/fix RPC errors. for RPC error,i usually check if name resolution is correct or not.Sometimes same IP address is assigned to multiple computers(2).so check that and fix the errors before you try to connect to wmi. Tried with echo off still its opening black window for the users. Do we have any other way around ? i ran it now on remote computers using psexec.I dont see any command prompt window. is there any way we can do it silently without getting black prompt of batch file. Thanks for the script and detailed information. 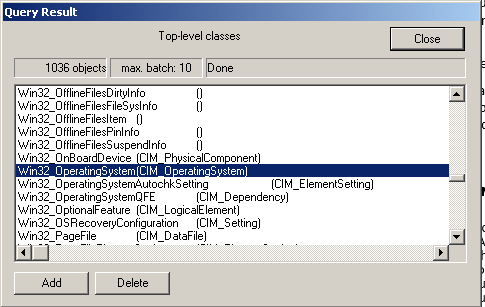 We have encountered lots of corrupted WMI problems on SCCM clients, that's really annoying!